Sciatica can make it hard to sit, stand or walk. Symptoms of sciatica include sharp pains running down the back of the leg that starts at the buttocks. The sciatic nerve branches off from the lumbar and sacral spine and runs through the pelvis and down the back of the leg. Due to its size and position, it is the most vulnerable nerve in the body. As you age, your spine can begin to degenerate and sciatica is most prevalent in the elderly due to its causes. Fortunately there are some simple, age-friendly exercises that you can do to help alleviate the pain of sciatica. According to "Anatomy and Physiology" by Kenneth Saladin, about 90 percent of sciatica cases are caused by a herniated disc or osteoarthritis of the spine. Conditions of the spine like those stated above are usually due to degeneration. Degeneration comes with age and occurs when any joint breaks down over time. Due to the spinal involvement in sciatica it is important to stretch the lower back when trying to improve pain. Since lifting, bending, twisting and prolonged sitting or standing can increase pain, these should be avoided. According to the National Institute on Aging, this exercise is good for your lower back, and can be performed in the comfort of a chair. To start this exercise, sit on the edge of a chair with your feet flat on the floor. Slowly bend forward with a relaxed neck and back. As you bend forward, slide your hands down the back of your legs. Only go as far as you feel comfortable and as you progress, challenge yourself to go farther. Hold this stretch for at least 20 seconds, then sit back up into the starting position. According to the National Institute on Aging, this exercise is an elderly friendly exercise if you need to stretch the muscles of your lower back. Lying prone on the floor, bend your knees and keep your feet flat. While keeping your knees bent and together, slowly lower your legs to one side as far as it is comfortable. Hold this position for 20 seconds then return to start and do it again on the other side. As an alternative, you may do this exercise seated in a chair. Sit with your knees bent and your feet flat on the floor. Slowly twist at your waist like you are trying to look behind you. Place one hand on the knee of the side you are twisting to and the other hand behind you. Only go as far as you feel comfortable and without pain. Hold this stretch for 20 seconds and repeat on the other side. Since sciatica can cause pain in the entire leg it is important to keep the whole leg flexible. According to the National Institute on Aging, you can start this stretch by standing and facing a wall. Place your hands at shoulder height on the wall. Step forward with one leg and bend it at the knee and continue to bend until you feel a stretch in your back leg. Hold this for 20 seconds then return to the starting position and stretch your other leg. Although it may hurt at first, moving and physical activity can help relieve the symptoms of sciatica. 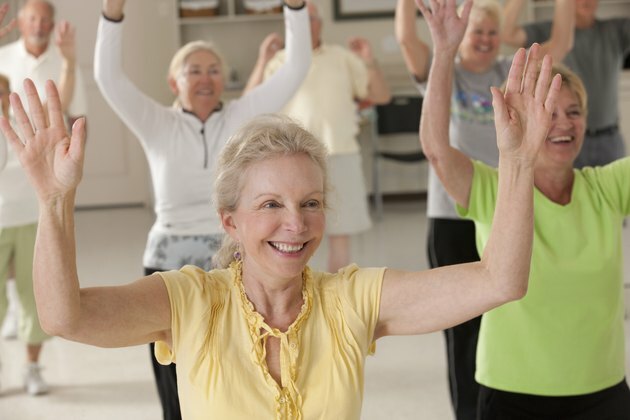 Exercises such as swimming, water aerobics or bicycle riding are low impact exercises that increase blood flow and range of motion in the spine and legs. According to Geriatric Physical Therapy, aquatic exercise can help increase flexibility and range of motion and decrease pain. Most importantly, choose an exercise that you feel comfortable doing and that does not cause you pain.